Jumping into podcasting can at first seem overwhelming. You might think you need to purchase a high-end microphone or pay for time in a recording studio. You can get started with podcasting with nothing more than your smartphone and an interesting topic to talk about. Thanks to the ever-increasing number of podcasting tools being developed, it is easier than ever to integrate audio recordings into your brand growth strategy. SoundCloud Podcasting is a must-discover resource for anyone wanting to make the leap into podcasting. Create your podcast, share your recordings via an embeddable podcast player or via mobile applications, and even promote your voice blogging efforts on Twitter via in-stream Twitter/SoundCloud cards. Building an audience for your recordings really couldn’t be any simpler. Audio Hijack lets you record audio from multiple inputs including mobile apps, microphones, and sound mixers. Save audio files in multiple formats, split files, and create templates from pre-recorded files. AudioSear.ch offers a helpful database and search engine for podcasts. Discover other podcasters in your sector, uncover audio styles you want to emulate, and keep tabs on podcasting trends. Sort search results by relevancy or date and filter according to genre. Discover podcasts on multiple topics including business, politics, news, technology, science, and comedy. If AudioSear.ch is has too much information for your needs, Shownotes might be more to your liking. Their podcast search engine lets you discover podcasts via keyword search, helps you create personal lists of favourite podcasts, and lets you search for similar audio recordings based upon previous podcast searches. Listening to the podcasts of others is essential if you want to hone your skills, pick up new techniques, and discover monetisation opportunities you might have missed. The Castmate app lets you record and share a podcast via your iPhone or iPad. No worrying over expensive microphones or recording studios; simply create your recording and upload it to Castmate’s audio servers. Who knew creating a podcast was so easy? If you want an all-in-one tool to help you get started with podcasting, check out Awesound. Their platform lets you record a podcast, create an RSS feed for your cast, and monetise your efforts too. 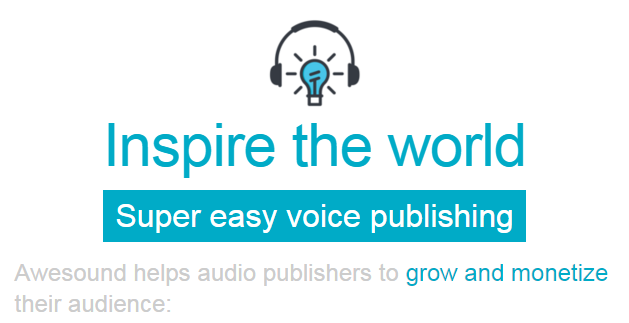 Sell sponsorships on your audio blog or monetise your efforts by offering premium content to paying listeners. Sodio is another cool tool to have in your audio blogger’s arsenal. Their iOS app lets you discover and listen to podcasts, but the coolest feature is the ability to create snippets of podcasts to share with your online followers. Perfect for introducing your podcast to new followers via social media, you can use this app to share snippets of your own audio cast or those of other podcasters you admire. 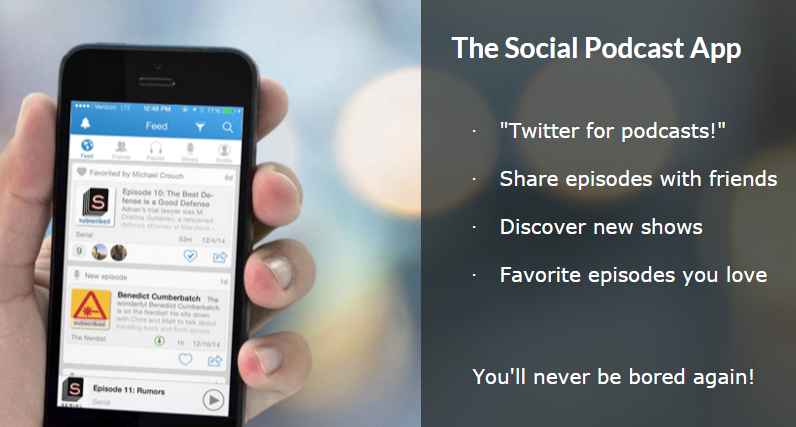 Knomad brings social networking to podcasting. This awesome iOS app lets you discover new podcasts, share multiple podcast feeds with your audience, and create playlists of your favourite audio broadcasts. If you want to integrate podcasting into your social media marketing strategy, Knomad is a must-add tool for your resource list. If you want to increase the potential of your podcasts, consider integrating transcriptions into your brand strategy. Casting Words lets you easily create transcriptions for your podcasts. Use your transcribed casts as part of your content marketing efforts to create everything from infographics to slide presentations. OTranscribe is another helpful tool for podcasters wanting to create text versions of their audio blogs. Use social media graphics to link to your transcribed podcast or post highlights of your cast on publishing platforms like Medium or LinkedIn Publishing. Podcasting is an excellent way to reach new customers and grow your digital influence. Whether you’re a stay-at-home blogger hoping to find a new audience for your ongoing content creation efforts or a small business owner wanting to stand out from other business owners in your community, podcasting can have a huge impact on your ability to build a powerful online presence. From creating intriguing new content to posting your recordings on social media, integrating podcasting into your brand building plans can be incredibly motivating. With so much potential for brand growth, do you think you’ll be incorporating any of these podcast resources into your brand building plans? What tools do you plan to use?